We are thrilled to offer unlimited lifetime license (for current version only) of Zoom Player Max 14.1 to our readers for Free. This is a limited time giveaway and can be used for an infinite period, but can't support upgrades to future versions. The license offered through this giveaway can be used to activate the program during the giveaway period only. Do you need a media playback software, capable of playing any media format with super clear picture quality and that supports playback for Ultra-High-Definition videos? If yes, then wait no more because Zoom Player Max 14 has everything that you need to play any media file. With the minimum CPU consumption, Zoom Player is the lowest priced media playback software in the market right now. Zoom player has simple, easy to use and classic user-interface, which can be further customized according to the users need. This media player is designed to be used by beginners & professionals both. You can limit or extend the functions of the zoom player according to your needs. Zoom player is a fully scalable media playback application with support for the latest media formats. While installing the program, it also installs the following modules/components like FFDShow, Haali’s Media Splitter, DirectVobSub, Gabest MPEG and Blu-ray splitter, FFMPEG core files and many other media-related modules for the smoother and better media playback. However, the program also offers you to choose the modules manually while installing it on your device. 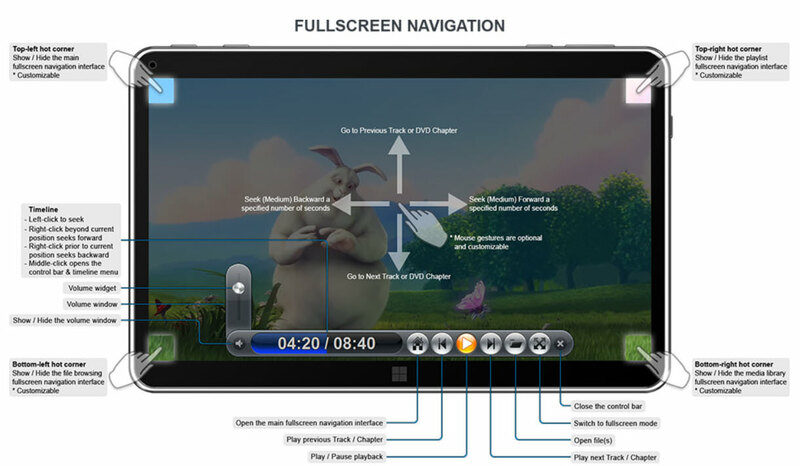 Zoom player is also a powerful media center application with easy to use five key option to select up/down, left/right right from the full-screen navigation interface. Supported Media Formats: Zoom player can play CDs, DVDs, and all audio and video formats including (H.264, XVID, DIVX, DVD, FLV, WMV, QuickTime, MPEG 1/2/4, MP3, AAC, DTS, Dolby Digital, FLAC and many more). This program is also capable of playing incompletely downloaded AVI media files. Hardware Specifications: Zoom player is designed to utilize the minimum CPU resources with almost no impact on the hardware device overall performance. It can be used on nearly every version of Windows with no specialized hardware requirements. File Browser, Chapter Editor & Playlist: With Zoom Player, you can quickly browse individual Audio & Video files or DVD chapters and more. You can also store the location of a media files using chapter editor in Zoom player, and a quick double-click will let you return to the location where a media file is located. The program supports playlist, which shows the list of all media files played recently. Playback History: The new Zoom player 14 can play your recently played videos from the last played position including restoring the previous setting like volume, subtitle, audio track & more. The new playback history in Zoom player provides more controls in retaining information & displaying with play dialogue history at a later period. Improved Media Library: The new Zoom player 14 overall user-interface has been polished with new icons and a cleaner background image. Zoom player 14 can now identify the media files in your library more accurately with the help of enhanced and improved TheMovieDB.org meta-data scraper plugin. You can now quickly switch between different media file rendering devices in real-time. You can now detach the navigation interface from the primary user interface to play it on the second Monitor. Improved Downloads & tracking: The full-screen navigation interface of new Zoom player 14 now shows the downloads in folder structure instead of a flat list. You can now pause/resume or more according to your priority. The download & tracking API is highly integrated with the open source client: qBittorrent. The new Zoom player sends the torrent files and magnet links to qBittorrent and tracks the download progress in real-time. You can download qBittorrent version 4 from the installation center in Zoom player. Zoom Player Free 14 is available at no cost and has basic features for beginners. Zoom Player Max 14 with 1 Year license is available for $29.95 (1 user 1 PC). Zoom Player Max 14 with lifetime license and support for free upgrades for life is available at $79.95 (1 User 1 PC). We would like to thank Mr. Chaim Rimon and his whole PR team for offering unlimited lifetime license (for current version only) of Zoom Player Max 14.1 to tech-acharya readers. Term & condition for Giveaway. This is an unlimited license giveaway. The giveaway license can be activated during the giveaway period only. Can be used for an infinite period but doesn’t support free upgrades. Note: Perform any of the following task from below to gain access to our special giveaway link and submit your email address to receive your free license of Zoom Player Max 14.1. This giveaway is valid until 29th Jul-18.